Our Burdani Deluxe room live up to their definition, ‘Relaxation’. These five Deluxe rooms are each floor. One of the Deluxe Twin room has a stand alone shower and a freestanding bath. Decorated with elegant Swahili sophistication. Indulge in the immaculate opulence and comfort Kisiwa House has to offer. 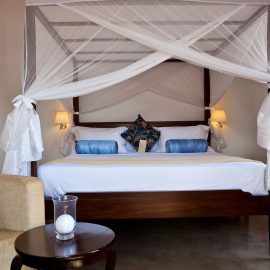 Set in a crisp fresh and sumptuous Swahili style. Our luxurious and spacious rooms and suites are like gems amidst a tranquil setting. The plush interiors with sleek clean lines speak of sophistication, while the lustrous colours and textiles whisper relaxation and romance. BOOK NOW, ONLINE AND SECURE!